Editor’s Note: Today’s article comes to us from an avid Theme Park University reader and a huge fan of themed entertainment. Alexander hopes to be in the themed entertainment field himself one day and we wish him the best of luck. Many thanks for the review of San Francisco Dungeon, Alexander! I visited San Francisco over the 4th of July weekend as a “last hurrah” trip before I leave for college in the fall. 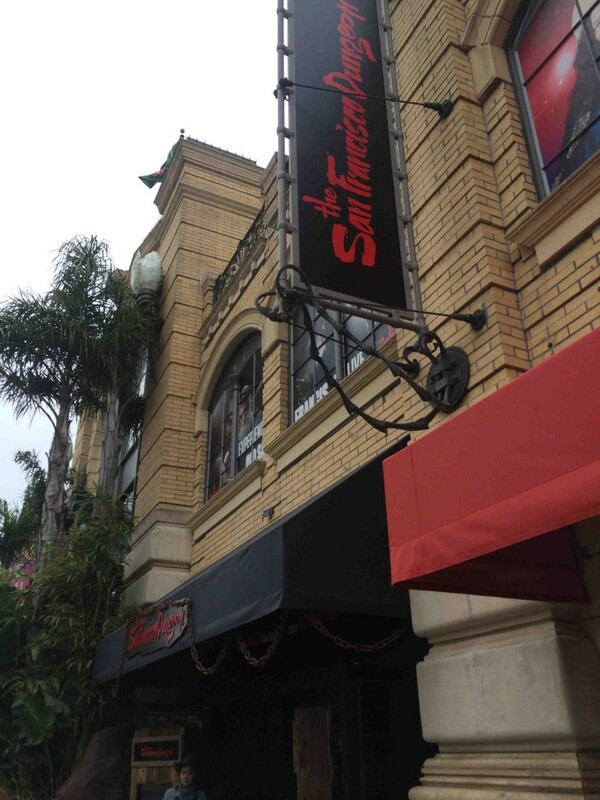 As a student who plans to pursue a career in the themed entertainment industry, I was excited to learn that the San Francisco Dungeon was coming to the city back in August of 2013. 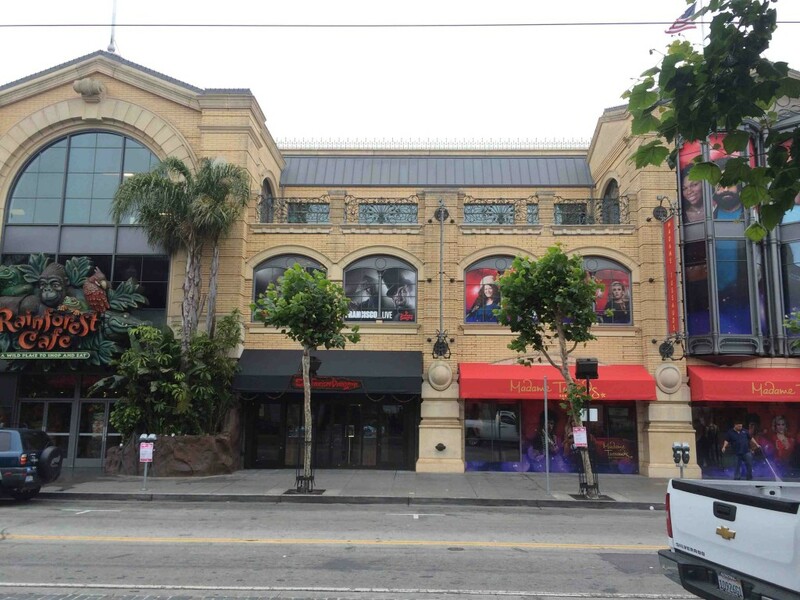 The SF Dungeon is located in Fisherman’s Wharf, across the street from the Boudin Bakery. 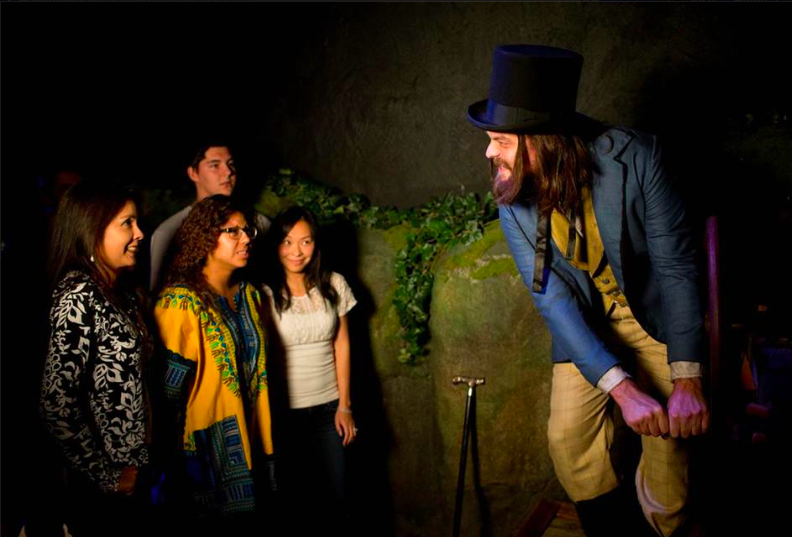 The attraction is built on the first floor and the basement of the former Wax Museum attraction. There is no reason to despair however, as Merlin also added a Madame Tussaud’s to the building, keeping many of the wax figures from the original exhibits. I unfortunately did not have the time to experience Madame Tussaud’s. As this was a family trip, I visited the SF Dungeon with my parents. We booked the tickets ahead online. I would highly recommend this, because you save $4 ($22 vs $26), and are guaranteed entrance. We chose the first morning time, the 10 – 10:30 a.m. slot. On an eerie fogged-in morning, we crossed the Golden Gate Bridge and entered the city. As we approached the entrance, we were greeted by a staff member dressed in full cowboy garb, with a gaunt and pale complexion. After greeting us, she directed our group inside to have our tickets scanned. This front entrance area oozed eerieness, with a strong western atmosphere. Gunshots, sinister laughter and haunting harmonica music (a little foreshadowing)) filled the air. All the staff wore full costumes and makeup. 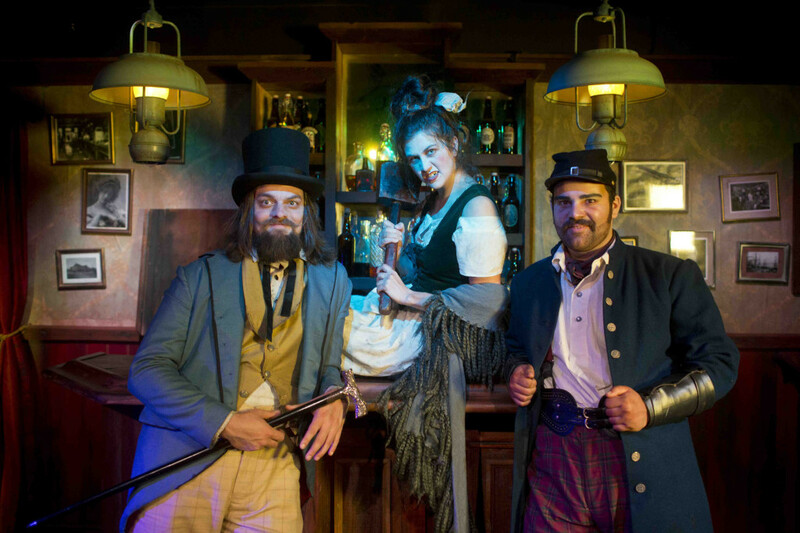 The SF Dungeon covers the history of San Francisco from the emerging Gold Rush of 1849, all the way to the Prisons of Alcatraz in 1907. The setting was sold 100%, even in the entrance room. After having our tickets scanned, we were directed in front of a camera for some quick photos and then ushered down into the basement via a dimly lit staircase. We were greeted at the bottom by another staff member who asked if we needed to use the restroom before the attraction, as the experience will take groups about an hour to complete. He then ushered us into a dark queue room with 3-4 switchbacks made from various barrels and crates. Close to the front of the queue was a large glass enclosure containing close to three-dozen rats skittering about. The entire space’s theming was even better than the entrance. A projector played a sepia toned recording of an infamous SF Robber, who presented the usual attraction disclaimers, along with the disclaimers usually found in haunts and other entertainment with live actors. Occasionally the background music and sound effects would stop and an overhead message would instruct us to turn off our cell phones/other electronic devices. At the front of the queue, we joined the other parties, who would be experiencing the attraction with us. 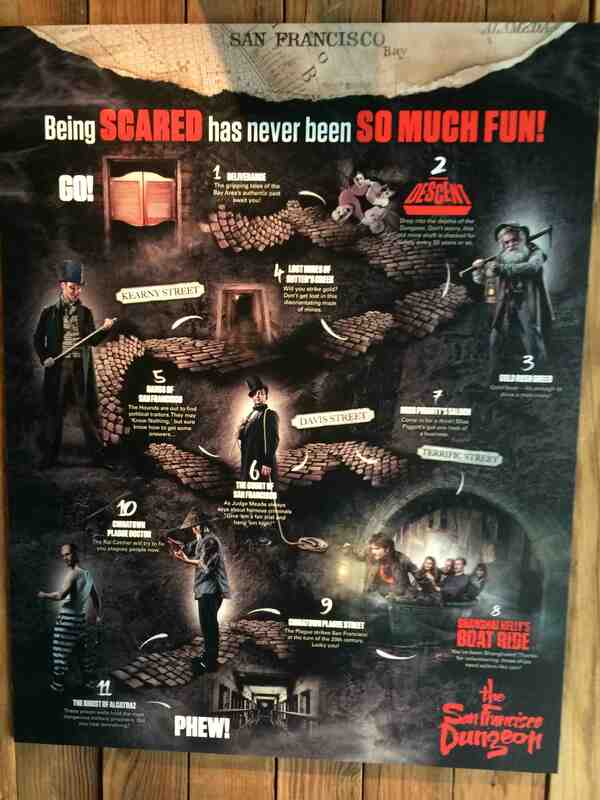 I experienced the San Francisco Dungeon with eight other individuals as a group of nine. This was a rather small group compared to what the attraction is built for (20-30 people). After waiting a few moments, the double doors in front of us slid open, and we entered the first room. As a theme park fan who visits Knott’s Haunt on a yearly basis, I was impressed with the attraction and had a blast going through it. The level of detail and theming is top notch and the experience is only made better by the actors who inhabit the darkened world. The sound design cannot be understated for this attraction, as every room was complemented by layers of sound and music with occasional dialogue. The way the attraction interacts with its guests is unique and something I personally have not experienced before, but do hope to see again in the future. The San Francisco Dungeon, I believe, is something people should experience for themselves. However, I would like to highlight a few of my personal experiences, as well as the types of technology and theatrical elements used to bring this experience to life. For that reason I’d like to put a spoiler warning here, as the technology does reveal a few surprises I didn’t expect going in. You’ve been warned! Beginning with the “Descent,” you are taken down an elevator by your host. Moving chains, a bouncing floor and very loud sound effects all accompanied the experience to make it really seem like you were plunging deeper and deeper into a mine shaft with no brakes. The actor in this space was fantastic and made great use of the dramatic buildup from the previous room. Gold Rush Greed had one of the more interesting uses of technology in the attraction. Upon entering a rockwork mining area you are greeted by a monk standing in front of you. The monk, however, is actually a completely static figure. The figure appears incredibly lifelike due to the projection mapping used on the face. Most people in my group didn’t even notice it was a static figure, partially because it does interact with the live actor in the space. The monk gives exposition about San Francisco and what happened to the natives when the greedy miners moved in. 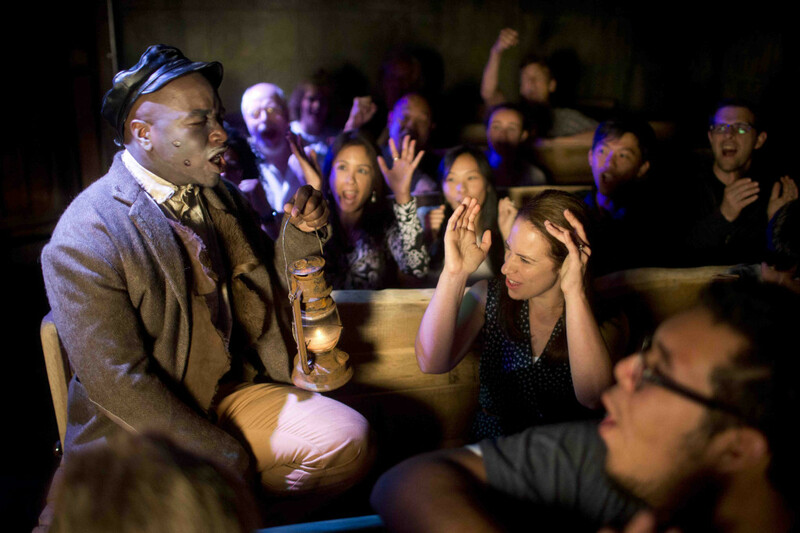 The Lost Mines of Sutter’s Creek was actually a mirror maze with several projected miners thrown in, telling you the wrong ways to go. While it’s only a quick mirror maze I enjoyed it quite a bit, and it did take a minute or two to solve. The Gangs of San Francisco is the first room where I got singled out. You are being interrogated by the “Hounds,” an infamous San Francisco gang from the 1800’s. After being told to raise my hand, the gang member was happy to inform me that I had volunteered myself. Lovely! After being subjected to several threatened tortures with various tools, I found myself the subject of the attraction’s most “PG-13” joke. Luckily, it is written in such a way that if there are younger children in the attraction (like there were in our group) it will fly right over their heads. Another person was also locked in a jail cell, then “left behind” as a prisoner when the house is raided. They rejoin the group after everyone exits. The Court of San Francisco was the second room I got singled out in (I’m on a roll!). Half a dozen people from the crowd are chosen to come forward and confess their crimes with varying degrees of hilarity. I was accused of being guilty milliseconds after stating my name because “We can’t have people named Alexander running around San Francisco, it makes us look dirty!” I’m happy to tell you that this was only the beginning. 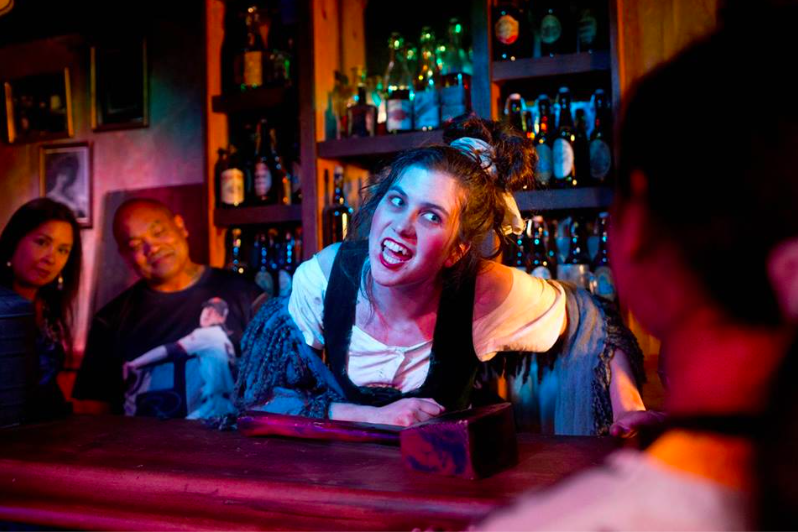 Ms. Piggott’s Saloon was the THIRD room in a row where I was singled out, once again being the subject a “PG-13” joke. I then guessed incorrectly the location of Ms. Piggott’s infamous liquor stash, which got my whole group Shanghaied. I just couldn’t win! This room contained effects that I did not anticipate at all when I first entered. Each individual sits in their own chair, and after I failed Ms. Piggott’s challenge, the entire room went pitch black (and I mean truly black, as it was impossible to see anything). We were then treated to a special guest, Shanghai Kelly himself (in audio form). Using surround sound and pitch darkness, it seemed as if he was walking around the room, sizing us up for his ships. Occasionally he would address specific individuals and “poke” the backs of their chairs with a knife as well as “hover” over them. The chairs do a bit more than poke, but I’ll let you discover that for yourselves. There are a few effects that are too good to spoil. Shanghai Kelly’s Boat Ride was interesting and probably the experience that people have been the most interested in by far. 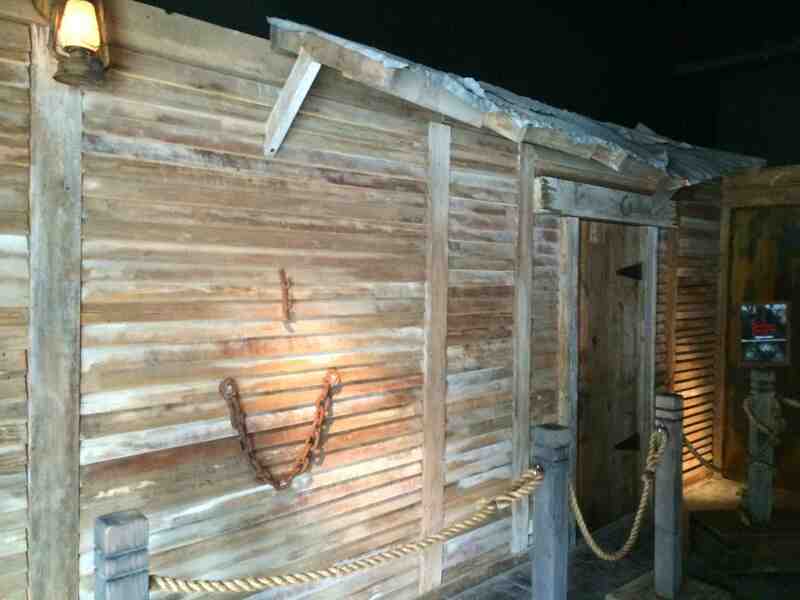 How would they pull off a boat ride inside of the basement? What would it consist of? I would like to start by saying that this is NOT a flume ride, it is a transport ride like Jaws that you take one-way (not a complete circuit, only a shuttle). A majority of the time the boat is in pitch darkness, so it was difficult to even tell that we were really in water until the end. This ride is unique in the sense that instead of staying in a stationary room, you and the guide “Niko” are in a moving vehicle that changes location to continue the story. Think of the boat ride as a moving room with your actor, and not as a self-contained ride, and you will enjoy it more. The boat did appear to have some extra motion to it during one particular moment I won’t spoil. Thankfully I was not singled out in this room. Chinatown Plague Doctor is the fourth room where I got singled out and this time I had the plague! While the rest of my group was treated to rats running under them (seat ticklers) and the Rat Catcher dissecting the body of the former plague doctor, I was strapped to a chair in the corner, with a bloody curtain off to my left. My wrist was “accidentally” slit spilling blood into the bucket next to me (whoops!) and then the good assistance decided he would forcefully remove the plague from me. After closing a set of curtains, guests saw the shadow of me being “worked on” before the whole room dropped into darkness and the rest of the audience was doused with the “splash” from the procedure. The assistance then emerged to tell the rest of the group that I had passed on, but I was free of plague. The group was escorted out with the curtain around me still closed. After they left the assistant drew back the curtain and I continued on with the group. In a larger group setting a lot of the people would probably not notice that I had rejoined. The Ghost of Alcatraz was the finale experience of the attraction. I will not spoil this room. I will say that it is the most “harrowing” experience in the Dungeon, and served as a perfect finale to end the hour long journey. If you want to find out what happens, you’ll just have to go yourself. And if you hear harmonica music, well, I wish you the best of luck. At the end of the attraction you are naturally dropped into a gift shop with a variety of photo packages available as well as wall to wall SF Dungeon merchandise. Upon entering, the two young girls in our experience group immediately asked their parents for one of the SF Dungeon teddy bears perched on the shelf. My family ended up purchasing a photo booklet that came with four photo ops from the entrance, digital download codes for the set and a booklet of facts and games from the Dungeon. One of the cool parts of the gift shop was the two projection heads sitting in boxes in the corner. These heads would occasionally sing songs and chat. It was a nice touch. If you happen to be in San Francisco I would highly recommend checking out the San Francisco Dungeon. The experience was fantastic and I will definitely be returning to the attraction with friends to see how they react to the Dungeon’s dark secrets. 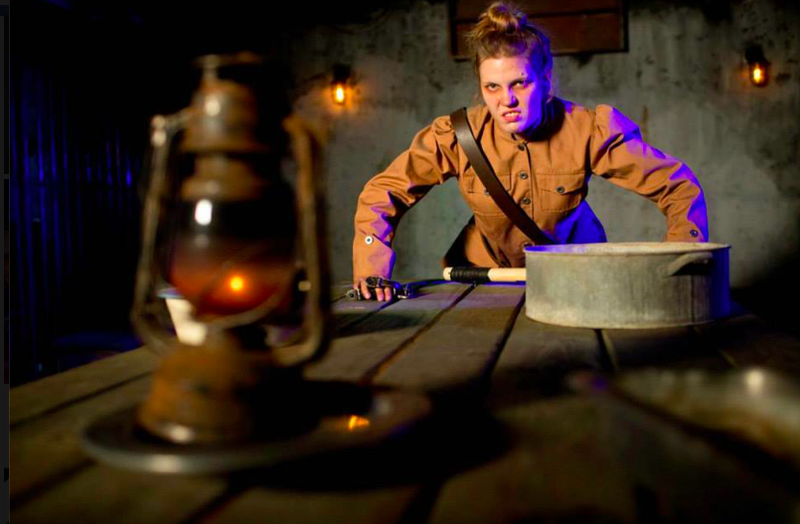 If you enjoy haunts, interactive theater or both, this is the attraction for you. I wish the Dungeon a successful summer and I am extremely excited to see what they have in store for the future here in the U.S.
Make sure to follow Theme Park University on Twitter and like the Facebook Page! 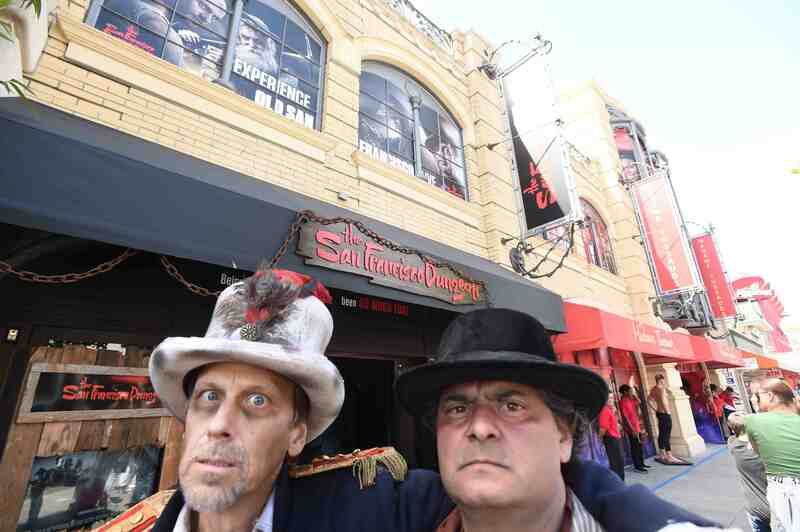 This entry was posted in Haunts and tagged Chinatown Plague, Fishermans Wharf, Madame Tussauds, Merlin Entertainment, Ms. Piggott's Saloon, San Francisco Dungeon, San Francisco History, Shanghai Kelly. Bookmark the permalink. Trackbacks are closed, but you can post a comment.